Tired of boring shrimp? Give these Zesty Grilled Shrimp Skewers a try. You’ll love them! It doesn’t take much to take shrimp from good to great. And while it may sound putzy to make a marinade AND a sauce, they are both so easy that your prep work is done in no time. 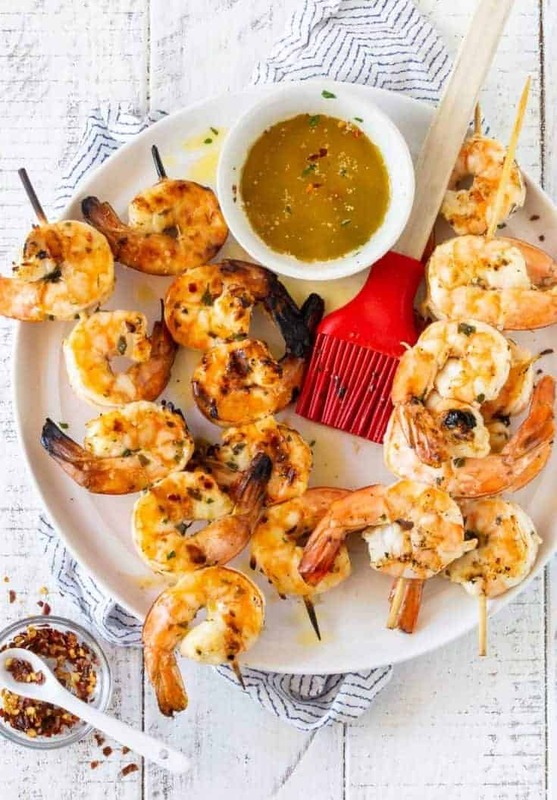 A quick spin in a marinade and a brush of a zippy butter sauce makes these Zesty Grilled Shrimp a mouthwatering delicacy. Threading the shrimp on wooden skewers makes grilling a snap because there is no worrying about those precious shrimp falling through the grates. Just be sure to soak the skewers in water for 30 minutes to prevent burning. What size shrimp should I use on the grill? I use larger shrimp when I grill (these are 11-14 in a pound) because I think it’s easier to cook them properly. Plus, when you use the larger shrimp, it’s easier to plan for quantities for a crowd. I suggest one skewer per person with a couple extras just in case. After all, who wants to run out of food? How do I make the zesty butter sauce? It sounds a lot fancier than it is. Start with some Kerrygold Salted Butter and melt it over low heat. (The rich creamy flavor of the grass-fed butter really makes a difference in this sauce.) Add some fresh herbs, some crushed red pepper and a squeeze of lemon juice, and you are in business. How do I serve the butter sauce? Right before serving, give the shrimp a generous brush of the butter sauce. It’s the perfect complement to the herby marinade and gives the shrimp a little extra punch of flavor without drowning the shrimp in butter. If you’re lucky enough to have some extra sauce, serve it on the side and dip all the things in it – bread, shrimp, veg, it all works, trust me. And the extra sauce keeps well too. Don’t believe how easy it is? 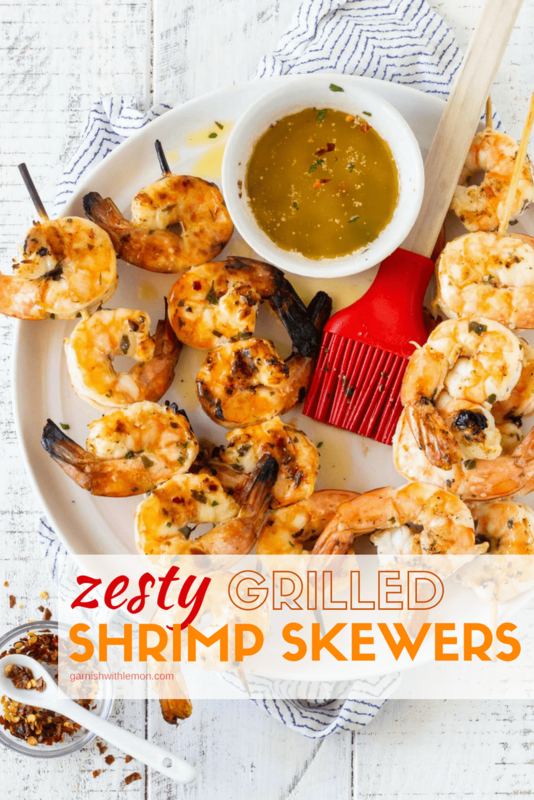 Check out our video for How to make Zesty Grilled Shrimp Skewers. The grill is for more than just dinner! As long as you have it fired up, start with some Goat Cheese Stuffed Peppers and finish your meal with Grilled Cherry Crisp. The more things you can do on the grill, the faster clean up is. And that makes summer entertaining even easier! 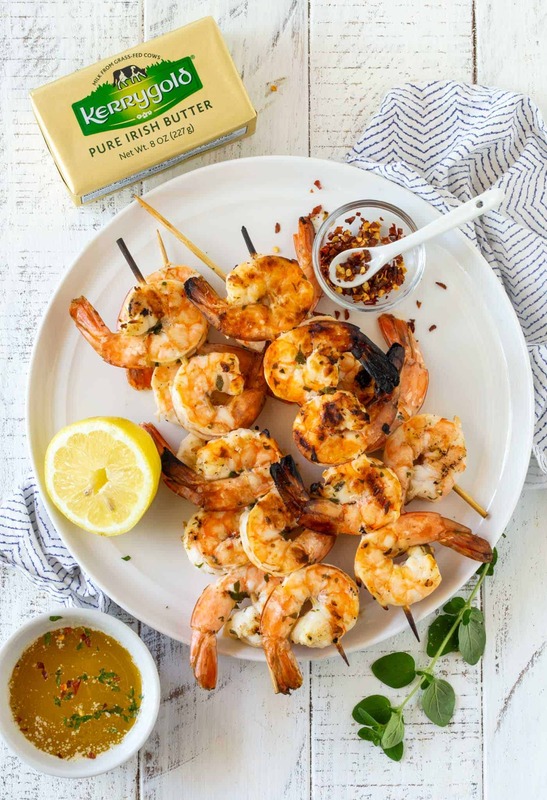 A quick spin in a marinade and a zesty butter sauce make these Grilled Shrimp Skewers an easy summer meal. Whisk together olive oil, oregano, lemon juice, tomato paste, garlic, salt and pepper in a small bowl. Place shrimp in a large bowl and pour marinade over the shrimp, tossing to coat. Marinate for 30 minutes to 2 hours in the refrigerator. Place wooden skewers in water for at least 30 minutes before threading the shrimp on them to grill. Grill shrimp on medium high heat for 3-4 minutes per side or until shrimp are done. Brush warm zesty butter sauce over shrimp and serve. So…my fridge is loaded with Kerrygold. I put it in my coffee and then absolutely everything else. It makes everything the best it can be. Love these shrimp!